HealthCloudPOL enables you to add and edit Parameter Groups. Parameter Groups are simply multiple analytes (parameters) derived from the Master Parameters List, grouped together for reporting purposes. From the Parameter Group Type List, select a Parameter Group or click New . The system displays the Parameter Group Details screen. Parameter Group Name – Type the name of the Parameter Group. 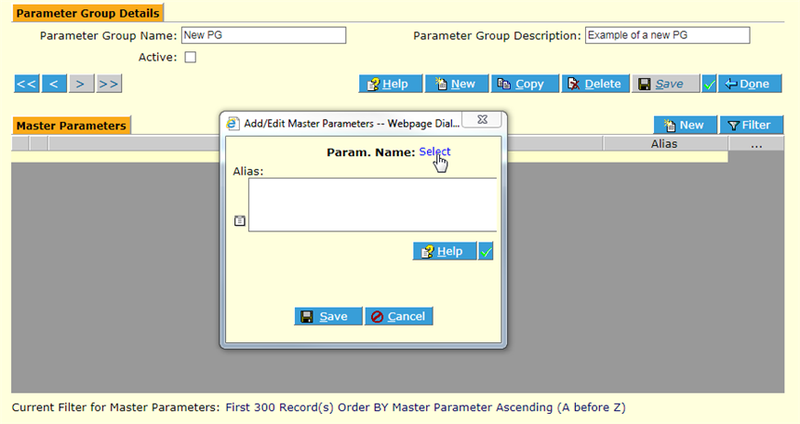 Parameter Group Description – Type the description of the Parameter Group. Active – Do NOT check the checkbox until you have added the parameters you want. Click Save . The system displays the Master Parameters frame. Select a Parameter Name from the list to edit or click the New button on the Master Parameters frame (not the one on the main section). 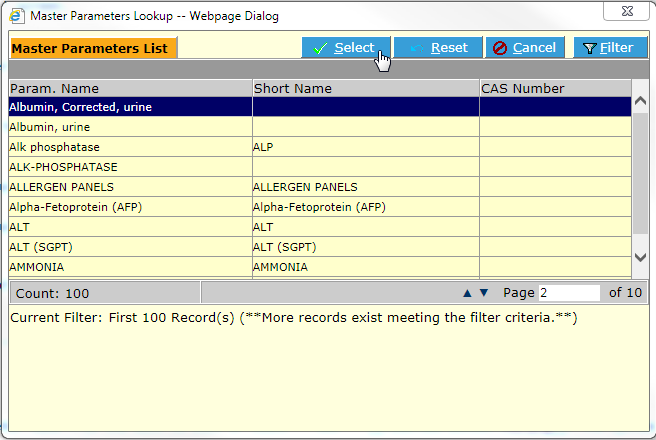 The system displays the Add/Edit Master Parameters web page dialog. Select a Parameter to add to the Group by clicking Select, then choosing from the displayed list. There are multiple pages in the list. Scroll using the up/down page control or by simply typing a page number and pressing Enter. You also can filter for an item in the Master Parameter list by clicking on the Filter and entering its name. Highlight the chosen Parameter and click the Select button, or just double-click on it. The system returns to the Parameter Group Details screen with the selected Parameter now added to the Group. It is not necessary to Save, the Parameters are saved when selected. First, be sure the Parameters and Group you are modifying is not currently in process. To change a Parameter in a Parameter Group, select the Parameter Group you want to modify and click the Edit link beside the Parameter you wish to change. Then simply select a different parameter in the same fashion as Add Parameters to a Parameter Group above. To remove a Parameter from a Group, click the Remove link beside the Parameter you wish to remove.